The AVK Series Feed Through Terminal Blocks offer savings in cost, space and time. 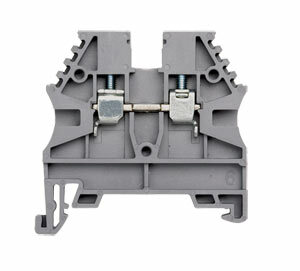 These terminal blocks mount on standard 35 x 15mm and 35 x 7.5 mm DIN rails and are design to meet world wide standards. The AVK terminal blocks come in all wire ranges and no pre-treatment of the wire is necessary, even for stranded wire. A full line of accessories are available including end plates, end brackets, cross connectors for bridging and marking tags. The AVK terminal block plastic housing is made from polyamide 6.6 thermoplastic resin with a UL 94 V2 rating for 105°C. This assures ample dielectric strength for any industrial application. The screws and clamps are made of steel with zinc plating, and together they generate a high locking action and provides an excellent vibration and corrosion resistant connection. The AVK series ground terminal blocks meet the strict requirements for low contact resistance, corrosion-free connection points, secured screws, green and yellow color coding and clear circuit identification. Since these terminal blocks are properly insulated, they can be positioned next to current carrying terminals. The grounding terminal blocks are structurally designed to mechanically and electrically connect to mounting rails, when DIN rails are mounted to the metal cabinet or sub-panels and properly connected to ground, the proper grounding process is complete. 注: Standard color is grey, red and blue are also stocked items. To order colored terminal blocks add suffix “-R” for red, “-B” for blue, “-Y” for yellow, “-G” for green and “-BE” for beige, no additional cost.